This can be done by looking at the Users Manual provided with the car. The factory recommended size is usually in the manual under the 'Maintenance' section. The most ideal way for you to find out which tyre size you should be purchasing for your vehicle is, to look at the tyres that are already installed on to your car. You can identify the size of your tyres by looking for the numbers on the sidewall of the tyre. The tyre size/information is generally moulded into the sidewall of the tyre. For example, 185/65R14 86H. 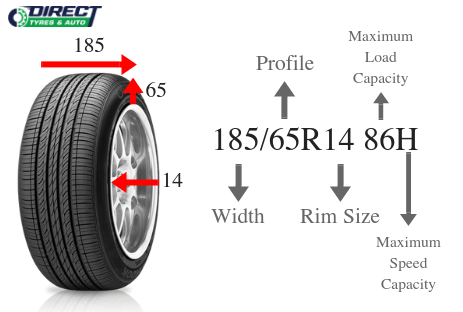 This code specifies the dimensions of the tire (refer to the image below), and some of its key limitations, such as load-bearing ability, and maximum speed. Alternatively, you can provide us with your registration number and we can identify which size is best for your car. Once you have identified which size you need for your vehicle, you can search our website for it. We have a wide range of tyres from entry-level products to high-end tyres at affordable prices. Based on your needs and budget you can choose which tyre you feel is most ideal. Additionally, if you send us a request through our quote page, our team can look into the options available and provide you with the information. This can be done in store if you would prefer. Check our opening hours to come in and our friendly staff will help you out. When ordering online, we highly recommend making an account with us to track your order easily. Once you have made an account, simply add the tyre you are purchasing to your cart and adjust the quantity. Once this is done, you are ready to check out through a secure portal. Once you have placed your order, we will be in contact to arrange a time to fit your tyres for you in our East Tamaki workshop as our prices are inclusive of fitting, balancing, GST, disposal of the old casings and new valves. We understand some of our customers are out of Auckland and in that case we can only ship the tyres to you. Your tyres are protected for up to one year under the manufacturers warranty. Terms & Conditions apply. - Checking the condition of your tyres. Looking for things such as cuts, cracks, lumps or tears. Remove any objects stuck in the grooves that could potentially cause a puncture, like stones, nails and screws. - Make a habit of checking tyre pressure. Having correct tyre pressure helps prolong its life and improves fuel efficiency – which is particularly important during long journeys. Checking is easy and can either be done during your visit to the petrol station, or at home if you have an accurate pressure gauge. - Check tyre tread. Tyre tread keeps your car gripped to the road and is particularly important in wet weather driving as it reduces the risk of skidding or aquaplaning and shortens your braking distance. Legally, tyre tread depth must be a minimum of 1.5mm in New Zealand.